After a thrilling 44-38 victory over Antigua and Barbuda to claim the Caribbean Basketball Confederation (CBC) Championships bronze medal, the BVI’s U16 Women have qualified for the 2017 Centrobasket Tournament year after its Sr. Women CBC debuted. Building on the experience from some of the young players who got their feet wet last year in the senior edition of the championships, BVI U16 Women on Saturday avenged a 29-23 loss to Antigua and Barbuda in group play, with a 44-38 triumph in the bronze medal game of the CBC Championships in Georgetown, Guyana. Shaliquia Fahie narrowly missed a double, double with a game high 25 points and nine rebounds. She also had five steals. 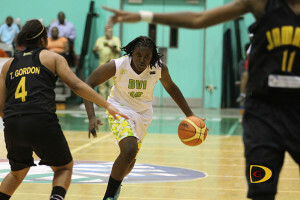 The BVI whipped hosts Guyana, 54-18 in its opener, as Shaliquah Fahie paved the way with 24 points and pulled 21 boards. Then they handed Barbados their first loss, 49-39, with Fahie dropping in 18 points to go with 10 rebounds, seven steals and two blocks. Mahkayla Pickering added another 10 points. Antigua and Barbuda bounced back from their three points 39-36 loss to Barbados by handing the BVI a 29-23 setback for their first win. The BVI however topped their grouping. Britnay Gore led Antigua and Barbuda with 11 points and pulled 13 off the glass, while Fahie led the BVI again with 12 points and 11 rebounds. The BVI fell to Suriname 49-41, in the medal rounds setting up the rematch with Antigua and Barbuda. Anita Tolud dropped a game high 24 points for Suriname while Fahie finished with 14 points and pulled 18 off the rack.